What could be more American than being a cowboy? 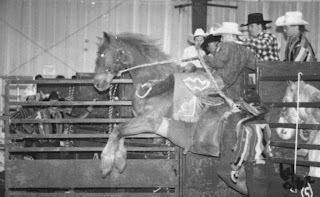 I had the opportunity as a teenager (and a young adult) to live the dream of being a cowboy, and that way of life is still a big part of who I am today. Some years back, I wrote a patriotic monologue that I think captures the cowboy way of life and embodies the true spirit of America. 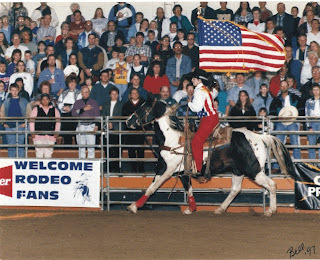 This was my signature presentation as a rodeo announcer, and no matter where I recited it – from Minnesota to Florida – it never failed to evoke an emotional, patriotic response and a rousing ovation as “Old Glory” made her pass in true cowboy (or cowgirl) fashion. Take a listen. That’s my beautiful wife Stacy presenting “Old Glory” at a bullriding event in Rochester, Minnesota. While I’m certainly proud to have been a cowboy (once a cowboy, always a cowboy), my abiding love of our country is the driving force behind my motivation to serve, as I did in the military, and as I now seek elected office. Your support in that endeavor is graciously and sincerely appreciated.